The town of Clifton was established solely because of the railway. This book chronicles the history of the town and the railway that served it. This book is an exposé of the photographic output of Eric Marggraf; considered by many to be Queensland's best railway photographer. His innovative and unique approach wonderfully captures railways in Queensland during the 1960s. 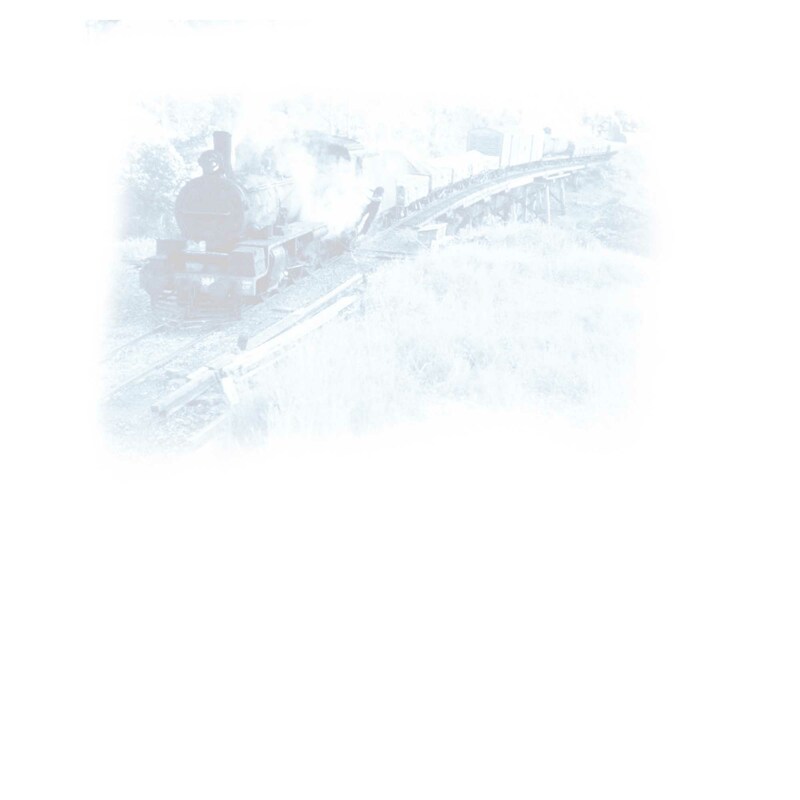 Of the images in this book, nearly three-quarters are scenes from branch lines that are now closed. Almost all of the rolling stock shown is long gone so it is indeed This Was The Railway. In volume 10, we open or archives wide to take you back to yesteryear with scenes on the Cairns Range showing the daily Kuranda tourist train and the Ravenshoe railmotor. There's scenes from transport week in 1981 with PB15 732 and C17 974 at Roma Street, Gloucester Street and Bowen Hills then tours in 1982 at Buranda, and the Sandgate Centenary. In 1964, 972 hauled an ARHS QLD tour to Marburg plus the Haden Railmotor, Roma Mail and a journey along the line from Oakey to Cooyar with views from on onboard and outside the railmotor. There's scenes at Oakey, Acland, Kulpi, Peranga, Narko, the Muntapa tunnel, Nutgrove, and Cooyar. There's scenes at the Ipswich Workshops and Corinda and a 1976 tour from Toowoomba to Oakey before taking a trip to Casino with 4418 in the lead. There's views at Clapham, Moorooka, Mayne and Roma Street in 1969 followed by shunting activities the goods yard at Roma Street before a 2000 class tour on the Beaudesert line and scenes at Bingera, South Johnston Mill, Mirani and a coal train at Dingo. ATHERTON - RAVENSHOE & BEENLEIGH - KINGSTON (2 DISC SET): Step back in time as you sit with the driver and experience travelling on Queensland’s remarkable railway network of yesteryear. This series explores the Queensland Railways from the drivers’ perspective as you travel with them on suburban and long distance passenger, freight and mineral trains. 2009 was the centenary of the opening of the railway branch line from Caboolture to Woodford which connected Woodford to the rail network of the state and, doubtless, brought the state capital much nearer. It would have made living and working in the district less remote from the facilities of both Caboolture and the capital city and brought Brisbane within a few hours of Woodford rather than a days' horse ride. The railway was extended to Kilcoy four years later. For just over 50 years the line served most of the transport needs of the area but by 1964 many rural railways were being closed or neglected and had services withdrawn. The line was closed beyond Wamuran in 1964 and services were suspended from Caboolture in September 1996. Today it is doubtful if locals ever give a thought to the railway that was a vital link in the lives of those living along it in the previous century. For nearly 100 years, Queensland's Government railways have provided many of their passenger services with Rail Motors or their successors, Railcars and Tilt trains. In the early years these vehicles enabled the economy of relatively cheap construction cost, low running cost and minimal crew costs. This edition of the Exploring Queensland's Railways series by Brian Webber details the history, present and future of the Railways in and around Toowoomba including the fascinating line ascending the Great Dividing Range - an early engineering marvel. It documents almost everything from locomotives, rolling stock and various alignment alterations. An essential guide for discovering the railways that stem from Toowoomba and a must have for any Queensland Railways enthusiast. The Way it Was Volume 9 features historic footage of the Railways of Queensland. Packed with historic footage and informative commentary the DVD comes with multiple audio features and quick scene navigation. Take a look at the fascinating history of Queensland’s Sugar Tramways in this compilation from rare archival railway film collections. Loaded with exciting rolling stock, featuring everything from steam, to diesel and anything in between! There are historic occasions, modern movements and plenty of retired rollingstock! Queensland Sugar Trains Volume One is packed with amazing never before seen historical footage and scenes that will never be repeated! They called them the "Whispering Death". These were the trackless trams of Brisbane.Extensive historical research, and footage filmed by the people who loved them combine to bring the fascinating story of Brisbane’s trolley buses back to life. SELECT ANY 5 TWIW dvds together and SAVE 25% plus save on freight at the same time! Compiled from films made during the final decade of the tramway era, this program presents trams at work in the streets of Brisbane. In hundreds of scenes the trams are shown in the City, Valley, and out to the termini of all routes. Included are also scenes of depots, race day and other special and unusual workings, along with much of the supporting appurtenances of the system. This book covers the interesting history of the Buderim to Palmwoods Tramway which operated in the Sunshine Coast hinterland in the early part of the 1900s.